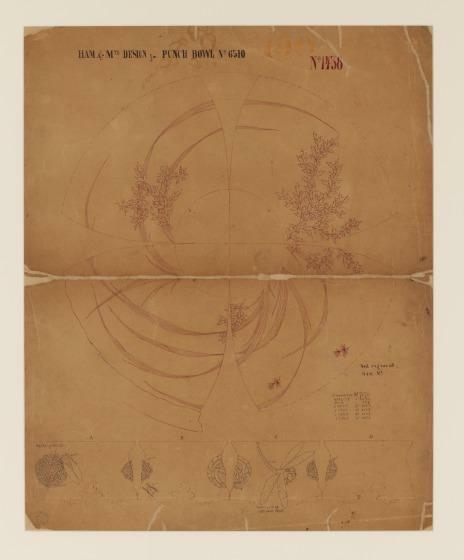 This hammering and mounting design drawing for the Tiffany & Co. punch bowl (1982.84), executed in red and black ink on beige paper measuring 27 by 22 inches, illustrates the sophistication of American silver design and production. Not only is the decorative scheme rendered in minute detail but also every insect and "spot" on the stem is identified by a casting or electrotyping number. In addition to this drawing, there would also have been a full-scale drawing that depicted the basic shape of the piece and indicated the dies and lathe chucks to be used in its production. Charles L. Venable, Silver in America, 1840-1940: A Century of Splendor (Dallas, Texas: Dallas Museum of Art; New York, New York; Harry N. Abrams, Inc., 1994), 343.